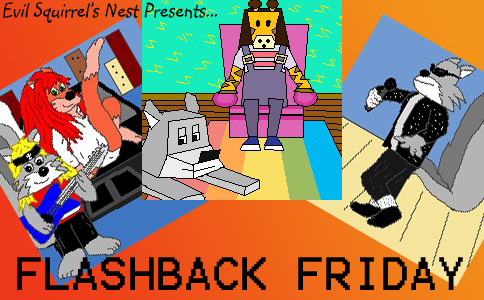 I mentioned last week that I was toying with the idea of adding a third regular feature to my blog, Flashback Friday. These posts would be about some memory I have from my younger days that just happened to jar itself out of my head one day because I hadn’t even thought of it in years. Most of the entries would be from the 80’s, 90’s, and given the way things become obsolete in a flash anymore, perhaps even from the past decade as well! For my very first Flashback Friday post, I’m going to write about the subject that inspired me to begin this series in the first place…. So for this Friday’s flashback, let’s talk about Strongheart dog food! First off, credit for the above image, which I found in a series of posts on Strongheart dog food labels from the blog Grandma Slump. The first thing I noticed in doing a rudimentary search on Google is that there are very few references to Strongheart at all, which leads me to believe it likely is a defunct brand, or at least as we knew it over three decades ago. 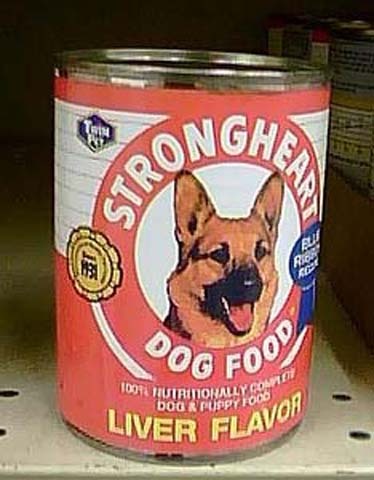 According to this article from 2006, it looks like a company named Natural Life Pet Products bought out the Strongeheart dog food brand sometime in the 1980’s, but it doesn’t go into specifics whether they continued to use the brand name or not. You’re lucky for the invisible fencing, kiddo! I was unaware until doing my research this morning that Strongheart dog food was named after a very famous actor from the 1920’s! Or as they’d be known in the tabloids today, Strongule…. 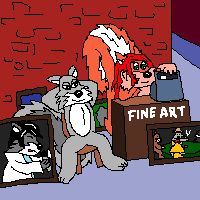 That’s Strongheart there on the left, obviously, who was one of the first canine actors in movie history! His real name was Etzel von Oringer (yes, even dogs apparently need an alias in Hollywood), and he was a police dog in Germany before he came to the States to begin his acting career. According to his biography on IMDB, Strongheart appeared in movies throughout the 1920’s such as “White Fang”. 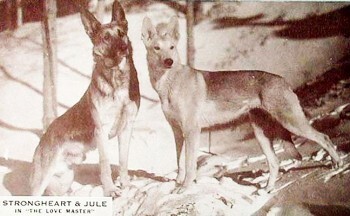 He frequently co-starred with a female German shepherd named Jule, who became Strongheart’s love interest, and many of their offspring themselves later became movie stars. Forget the Baldwins, the Douglases, and the Marx Brothers… the Stronghearts were the original acting family! Eat your heart out Paul Newman! 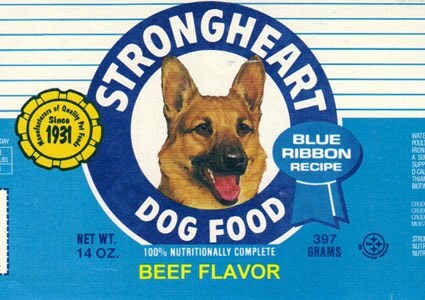 So, do any of you have any memories of Strongheart dog food out there, or know of its current status? I was surprised how little I could find about it on the internet where even retro items generally have devoted fans out there and seemingly everything from modern US history is documented somewhere. At least the lack of information on it justifies its status here as a truly forgotten memory of days gone by… and isn’t it such a joy to be reminded of something you hadn’t given a thought to in a long time, no matter how trivial or mundane it may seem? Until next time, (plop) enjoy your canned shaped dinner! 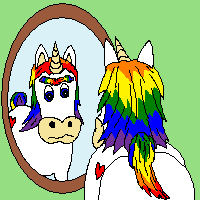 No Rainbow Donkeys were used in the manufacturing of Strongheart dog food. This entry was posted in Flashbacks and tagged actor, can, can shaped, canned, defunct, dog food, flashback, friday, memory, retro, strongheart. Bookmark the permalink. Never heard of Strongheart until now. 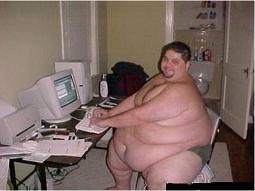 Put something on Craigs List. Would be fun to see if anything turns up. You know, I just noticed where it says “Twin Pet” in the upper left corner of the can in the Liver Flavor picture! We sell the Twin Pet brand at Mecca (absolutely cut-rate and terrible product labeling, nothing near as lovely as ol’ Strongheart), and I wonder if that’s what Strongheart got absorbed into…. I must look into that! “100% nutritionally complete” with all the beef “flavor” yer dog can handle. yum. yum. LOL on “beef flavor”. I wonder if it contains Red Dye #6? I just realized why I hate cranberry sauce. Because when it comes out of the can, much like dog food, it remains can shaped, complete with ridges. Plus, I just don’t really like the taste that much. Maybe cranberry sauce just doesn’t have enough natural beef flavor, or you haven’t tried the Blue Ribbon Recipe, or… eh, I can’t imagine anything that remains can shaped can possible taste good…. What handsome dogs the “original acting family “are. German Sheps have such a presence! I never saw anything like that over here but then we usually make up our own dog food of meat, pasta and veggies. 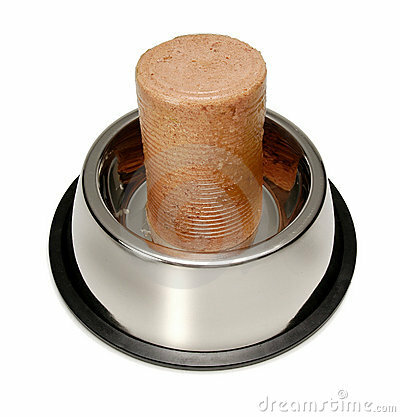 I find canned dog food can give dog’s gass. 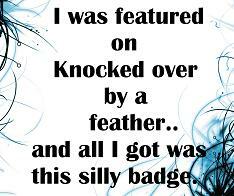 That must have been before my time, or slipped away into past disregarded memories. It was jellied cranberry sauce that started the conversation in the first place. The best shape for food is “can”, it’s the food of the gods! I knew you’d remember! I wonder if Strongheart came in Cranberry Flavor…. I worked as a retail merchandiser for Strongheart in the mid ’70’s, until Swift & Company bought them out. Ten years later I worked for them again as a Regional Sales Manager. The President had been my old Sales Manager. Our plant and main offices were still in Kansas Ave. in Kansas City, KS, but the owner of the company had an office outside of Pittsburg, KS ( Frontinac, KS ). In addition to packing Strongheart pet food, they also did a lot of co-packing for a dozen other labels. I haven’t seen any of there products in the Kansas City area for many years. It was one of the original pet food brands on the market. Cool! Thank you for adding some insider insight to this post! Absolutely! 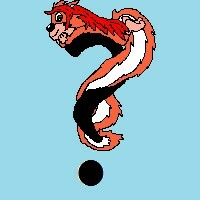 My email address can be found in the Contact Me page (Under Important Stuff) in my blog’s header. I have a catch-all type photography feature I run on Tuesdays, and I’d love to use your picture, with proper credit. I just bought a case of it at a discount store called ‘Dirt Cheap’. It’s still available and is distributed by aSimmons Pet Food out of Siloam springs Arkansas. Thank you for letting me know! I could find nothing at the time I wrote this post whether dog food was still made under the Strongheart brand. I’m curious if the cans still have the classic label design… the Simmons Pet Food website contains almost no information at all. Strong Heart canned food is on sale at Job Lot (chain of stores in New England) in RI this week at 2 for $1. I had never heard of it and found this article looking it up. 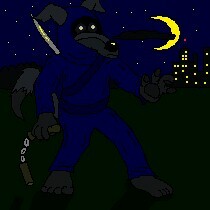 Label is a bit updated but still has the former German Police dog/actor. I won’t be buying it but just want the writer to know it’s still on the market. Made by US/Canada co Simmons. Check out your pet food at DogFoodAdvisor.com or make your own. Thank you! This is the first time I’ve heard of Strongheart being sold outside the Midwest and South.